To mark the opening of the Barrel Room, Boatrocker has released the very first beer put through its brewery in 2013. The beer produced that day was transferred into French oak barriques from Yering Station winery since when various strains of Brettanomyces, Pediococcus, Lactobacillus and Saccharomyces have been allowed to develop. The aim was to follow as closely as possible the techniques of the traditional lambic brewers of Belgium. 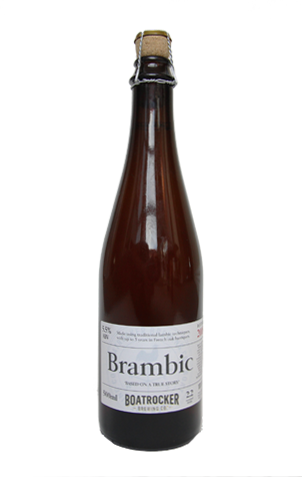 Given the name lambic can only technically be given to beers from that region (not correct – see below), Boatrocker has decided to christen this – and subsequent beers of its ilk from the sour program – "brambic" or Braeside lambic. Various vintages are being created, some to be blended with each other, some with fruit. This first release, however, is pure. And by pure we mean the liquid taken from the oak barrels and decanted straight into caged and corked 500ml bottles. When finally transferred to your glass there's initially some malt sweetness and plenty of oak to welcome you, but they're diversions from what's to come: its full, uncarbonated, almost creamy, body delivers heavily on the sour, acidic front, adding a lingering, tannic dryness backed up by a dose of background barnyard. The rep who dropped in the sample described it as "intense". He's not wrong. Update: Ale of a Time pointed out there is no geographical regulation concerning naming beers lambic. Instead, this and other beer styles is covered by an EU scheme called "Traditional Specialty Guaranteed". Either way. Matt has always said he would never call his beers of this ilk lambics out of respect to the traditional makers.